Numerous stacking and economical plastic container models. 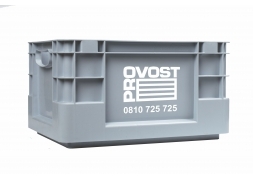 Model Eco in polystyrene or container with spout top of the range in polypropylene and recommended for storing heavy items; choose the plastic container that best suits your activity. Provost assists you in your projects. Request a customized quote, one of our Provost experts will advise you of free charge on the best solutions.